NOTE: The game is replaying on the Big Ten Network tonight (November 3, 2014) at 10:30pm. You should watch it. 1) Purdue is the greatest of all time, will go undefeated, is submitting (at least) four nominees for the Club Trillion Player of the Year belt, and completely wiped the floor with the jabronis on the other team. 2) Purdue is the worst, can’t win a game, needs to find more eligibility for Hummel/Johnson/Moore, and Matty should be fired (A VIEW NOT CURRENTLY ENDORSED BY THE AUTHOR OF THIS POST) because we just lost by 235 points. Thankfully, yesterday produced reaction #1. Purdue predictably wiped the floor with the DII California University of Pennyslvania Vulcans, 89-52. I want to make a bunch of Cal U Penn jokes, but I’ll refrain because I completely misplaced a school roughly 40 miles away from where I currently live and their mascot is A FREAKING SHIRTLESS VULCAN. As a responsible (and kind of busy) writer, I won’t overreact positively or negatively. I’ll just leave you with player notes in the Good/Bad/Ugly sections below. And though my mind works in a very numbers-oriented way, I’m not going to post misleading and inflated stats. The preseason is for qualitative observations that might lead to trends against real competition. In every non-darkest timeline reality? Seconds after tip off. Bryson Scott was making some great, level headed passes that he absolutely couldn’t (or wouldn’t) make last year. Here are two more GIFs, just for good measure and a larger sample size. All of the reported hours Bryson put in this summer towards taking over the point guard position are apparently paying off, because that’s a level of playmaking talent I really didn’t know he had. Jon Octeus looks to be a perfect and impactful late-addition by Coach Painter and the staff. Does a great job slashing into the paint and drawing contact, was showing a promising shot, and has the length to bother opposing guards on defense. There were several instances of Octeus settling down some sloppy Purdue offense by getting to the line, allowing the team to regroup. File that sentence away for Big Ten season, because it’s going to be an incredibly valuable skill against the best conference in the country. These two Vince Edwards-AJ Hammons plays: FIRST SECOND I’ve maintained this since like 2012: Vince Edwards will be a starting forward from Day 1, and will have a huge impact on a roster that needs direction. Two 7-footers going against a 6’6” center means feasting in the paint. In addition to absolutely owning the paint defensively, AJ Hammons displayed a shooting stroke that looked pure (though it didn’t hit the mark enough), and was using his body to dominate in ways we rarely saw last year. It also looks like Hammons is in considerably better shape this year, as even his running strides look so much smoother than a year ago. Isaac Haas is a giant giant of giant proportions, and he’s not afraid to use that size to his advantage. Jacquil Taylor looks really long, pretty athletic, very versatile, and a lot better than I thought he would be to start the season. Before yesterday, I thought he’d certainly redshirt. Now? I’m not sure. That’s a good problem for the coaching staff to have (for once). Zone defense was used, with a good amount of success. Then again, we were playing a DII opponent. So, you know, grain of salt. Bryson is still in the habit of bull-rushing drives in transition, which often result in turnovers. He’s definitely progressed, but needs to grow out of this ASAP. Hammons floated out of attention a few times during defensive rebounding, when he was sort of waiting for balls to come to him rather than actively boxing out. 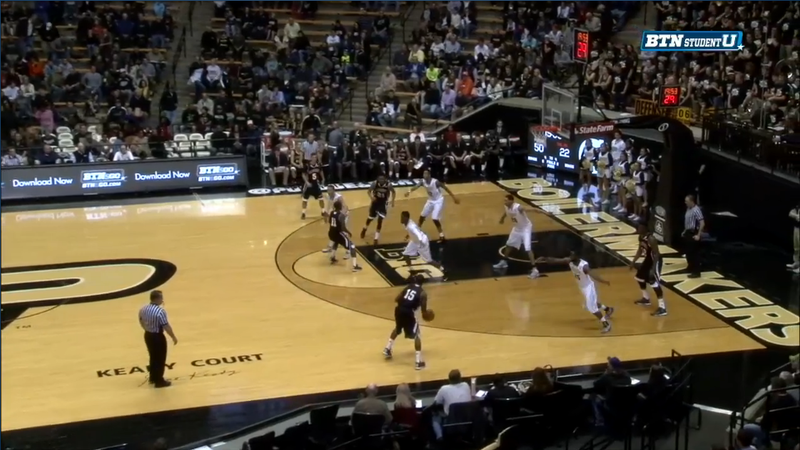 The offense still gets a little muddled when opposing defenses are rough with Hammons/Haas. Not enough movement, though this could be chalked up to complacency with a 40 point lead. As said above, this improved…but it wasn’t without some hiccups. Haas needs to keep the ball high in the post. He’s also as slow as molasses in the post, which didn’t hurt against the Vulcans but will against the likes of Frank Kaminski, Zak Irvin, and Branden Dawson. Basil Smotherman is still without an elite skill, while parading around elite athleticism in a professional frame. I’ll write more about Smotherman later this week, but he is someone I’m afraid will get buried behind a plethora of more ready wing talent. Hammons walked out of media room after media w/ a huge smile, flanked by PJ & Isaac & said "This is going to be a fun year with these guys"